Beach or Golf: 31 Sea Lane, 5-BR Home W/Pool and Spa. This home is located at 31 Sea Lane on the 15th hole of the Robert Trent Jones Golf Course in Palmetto Dunes. It is one of the most inviting homes you can find on the island. The layout of bedrooms with private baths offers a perfect setting for large family groups or multiple couples getting together for a great vacation! The spacious living room offers a sofa, loveseat, and two club chairs. Sliding glass doors from this room and the adjacent family room lead to a brand new deck leading to a private pool area complete with spa, grill, and beautiful golf views. The family room has a 2 large couches, an overstuffed arm chair and two swivel club chairs with a big screen flat TV, and DVD. The home has had the kitchen cabinets refurbished this year and the family room furniture has been newly replaced this winter. Just off this room is a kitchen with a breakfast table for four. The dining room is to the left of the entry, and is furnished with a table for eight. Two bedrooms have two queen-size beds in each, TVs, DVDs and private baths. The third bedroom has a king-size bed, TV, DVD and private bath. The second master is located across the hallway and offers a king-size bed, TV, and private bath. WE have totally renovated two of the bathrooms with walk in full tile showers and floors with a bench to sit for added convenience. One of the bathrooms is the double queen bedroom and one is a master bedroom suite. The bath cabinetry are beautiful painted wood with granite countertops and have upscale bathroom fixtures that add a beautiful detail to the countertops. Unfortunately, the bathrooms are so new that we have not had time to photograph each one to put on this site. The two bathrooms that have been redone are on the pool side of the home.The fifth bedroom was designed for children. Located just off the kitchen, the room is furnished with three twin beds, a TV, and VCR. This home is the perfect spot for those looking for a quiet relaxing retreat. The newly replaced deck is large and has a Jacuzzi situated at one end which allows privacy yet offers beautiful and serene views. The pool is 16X32 feet with a depth of 3 feet in the shallow end to 5 feet in the deep end. The pool is offered privacy from the golf course by the home's landscaping and trees.The pool gets sun all day long with a cluster of trees providing shade near the shallow end. Our house on Sea Lane is located on the Fourth Row from the island's best beach. There are walking and bike paths that allow easy access to the beach. Our house on Sea Lane is located in Palmetto Dunes within walking distance to the Marriott Hotel, tennis, Trent Jones golf, general store, and the canoe and bike rentals. If you are looking for a great home in the best neighborhood with a private setting, you cannot beat this home. All bath, hand and kitchen towels and linens are provided. A starter set of soaps, toilet paper, paper towels and detergent are provided. THIS IS A NON-SMOKING AND NO PET HOME. NO EXCEPTIONS! The home is located on the 15th hole of the Robert Trent Jones golf course. 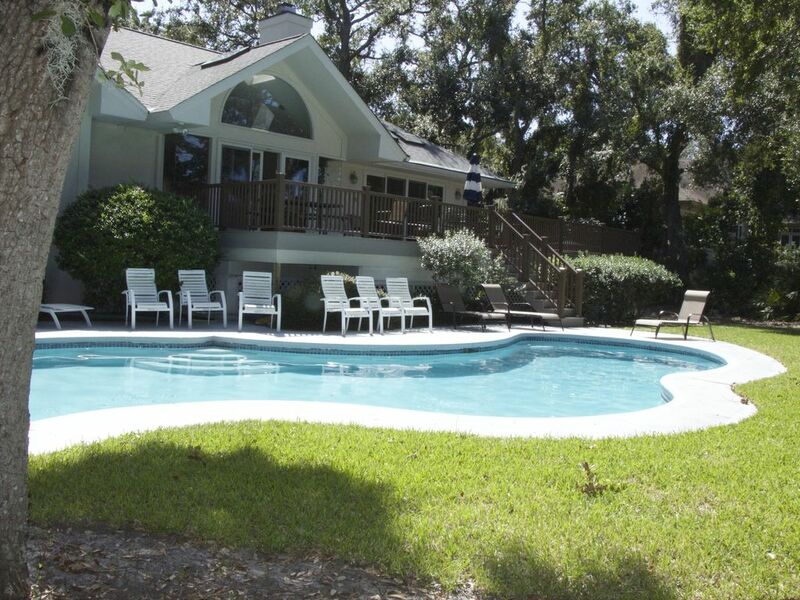 *Pool and Hot Tub can be heated separately and at an additional charge. We were a group of 8 golfers. This house worked out perfectly. The house was perfect for our family Christmas get together!!! It was clean and well equipped. The hot tub was fun to have for entertainment. The bedroom setup worked perfectly for our group. Everyone had a comfortable place to stay. Nice open sitting space and plenty of room for meals. It made for a wonderful time to enjoy each other!!!! Would definitely rent again! We live in NC and were not able to travel to Hilton Head due to the Hurricane. The road's were flooded and closed. We could not leave our house. Sorry we missed our vacation. The stars are for the property owner she is amazing. Clean, perfectly located, beautiful neighborhood. The house was amazing and the pool was perfect for little ones and the grownups. All of us are either military active duty, retired or veterans and it was nice to go somewhere that we could totally unplug for awhile and forget the outside world. This is the ONLY time of the year our entire family can get together for a reunion and we would love to stay here next year... Great communications with the owners when we had questions, no problem getting in our out. Thanks so much! Great home for a family vacation! We really enjoyed staying in this large, lovely home! The rooms were spacious, the beds were comfortable, and we really enjoyed the large pool, hot tub, and deck area! This was our second stay at this great vacation home...super pool, hot tub and deck facility. There's plenty of room for large families...ours numbered 15. Close to restaurants, stores, bike trails and the beach. The owners are quick to respond to concerns as is their management group. We plan to return next year.